This is one of the photos I found of the school that I took before it was demolished. They were all taken on slides and I've found it difficult to get a good scan, but I've fiddled around to produce something that looks OK. The film has a processing date of Jan 1989 and I would conclude that is when they were taken. It's obviously winter and light levels were not that good either. Note from LNW: This is the best one of Michael's three photos and is a welcome addition to our photographic archive. 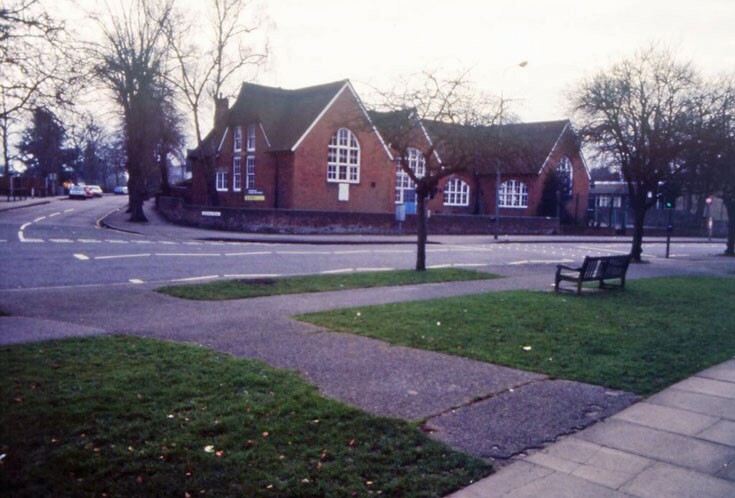 For those new to Banstead, the school used to be on the site currently occupied by Waitrose which was built in a similar style. Michael's photograph of the old school is the best I've ever seen - and as one who was taught there, it brings back affectionate memories. I remember Mr Fenton drew a chalk picture of a kingfisher on the Blackboard in his classroom, after a while he turned the board around to face the window. He received many compliments on the artwork from people passing by!